Mar. 29 – Jess Bommarito has no trouble describing the moment she was crowned the winner of Norfolk County’s first ever ‘Win This Space’ contest. Norfolk senior planner Kayla DeLeye’s words meant a complete career change for Bommarito. After receiving free rent for a year to house a business at 56 Norfolk St. South in Simcoe, she left her gig and poured her heart into ‘Groundswell Coworking’. Groundswell allows entrepreneurs a chance to work remotely and be surrounded by fellow small business owners in downtown Simcoe. Memberships can be purchased monthly, weekly or even daily. Win This Space is an initiative of the Norfolk County Urban Renewal Partnership Project. 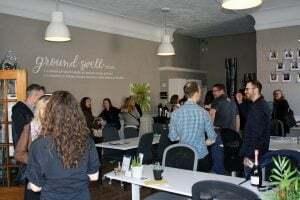 Its objective was to fill at least one empty downtown space, assist an emerging entrepreneur and add to the revitalization of downtown Simcoe. A total of 22 applications were submitted and judged on criteria such as creativity and uniqueness, relevance to downtown, and market need. 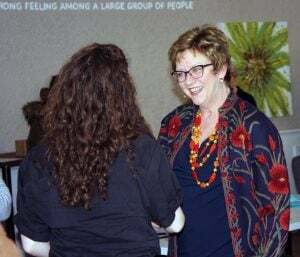 Groundswell hosted an open house Mar. 27 to much fanfare. On hand were a number of users – photographers, graphic designers, filmmakers and software developers among them. “The reception has been absolutely amazing,” Bommarito said. Bommarito said that even folks who can’t utilize the space see its benefit to a blossoming downtown. She describes the feeling in the core as a “party” atmosphere. That’s music to Garwood’s ears as Norfolk aims to add forward-thinking individuals onto its business roster. For more information on Win This Space, log onto norfolkbusiness.ca/winthisspace.